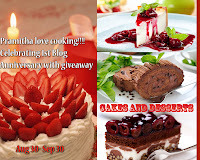 So as usual am posting sweet, baking recipe for the 250th post. 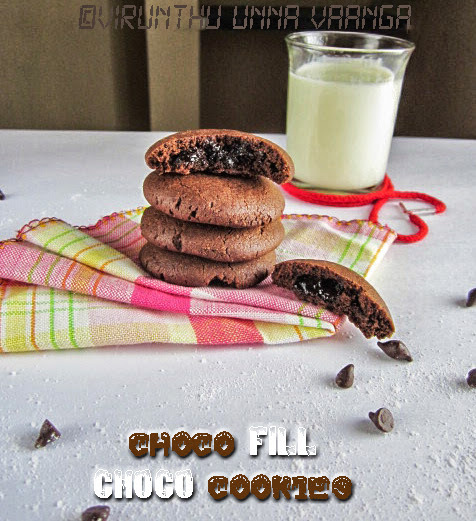 Why I want to try these cookies, did you taste the Sunfeast Dark fantasy Choco Fills, it tasted really awesome and in our family we loved it a lot. 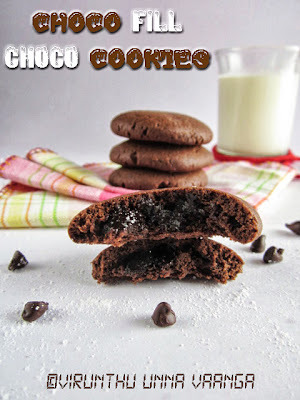 Especially I and dad love the cookies to the core, so my dad asked me to replicate the Sunfeast Dark Fantasy Choco Fill cookies in home, so without any delay I gave a try to make replica of the yummy chocolate at my own. 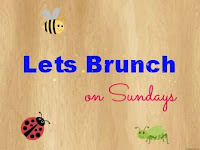 I would like to share the post for Let’s Brunch on Sundays event, which is initiated by +Priya Suresh akka from Priya’s Versatile Recipes and +veena krishnakumar akka from Veg Nation. 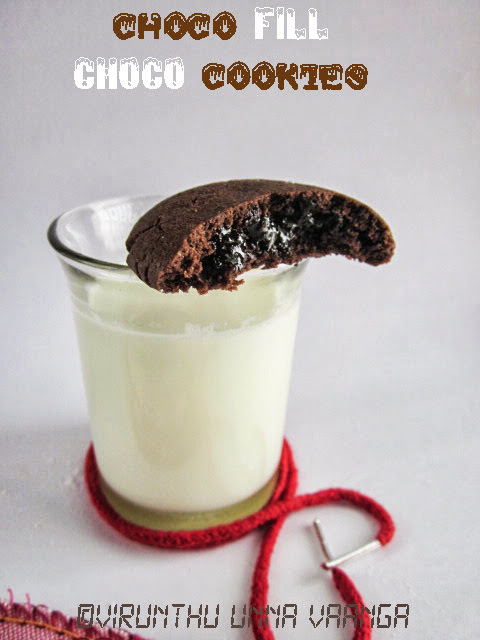 You know I prepared the cookies on Sunday eveningJ. 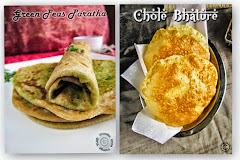 So is apt recipe to kick start the event and enjoy with you tea time with your favourite shows on TV. Add all the ingredients together in a bowl in the same order and beat it well till comes frothy. Take a wide bowl add butter and powder sugar beat it till smooth creamy. Now prepare the egg substitute add 2 Tbsp from the mixture to the butter and beat it well. Then add vanilla essence and mix it well. Now sieve the maida and coco powder together and add to the wet ingredients and fold it well. 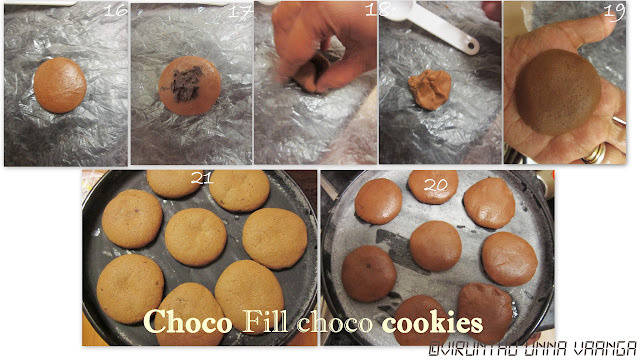 It will be sticky but no worries, transfer the dough to the plastic cover and keep it in refrigerator for 30 minutes. Take the dough from the refrigerator and divide into small balls; I used 1 Tbsp for uniform size. Preheat the oven @ 180 degree centigrade for 10 minutes. 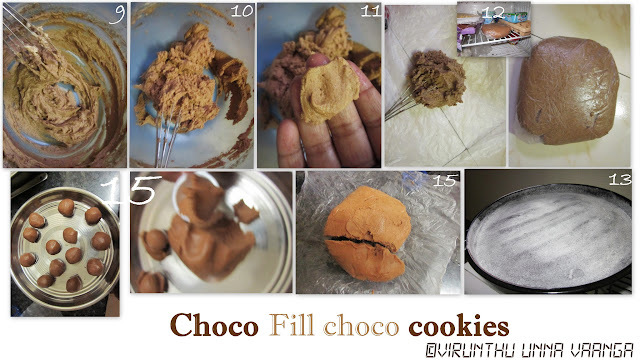 Meanwhile grease the cookie tray with butter and maida or use parchment paper. 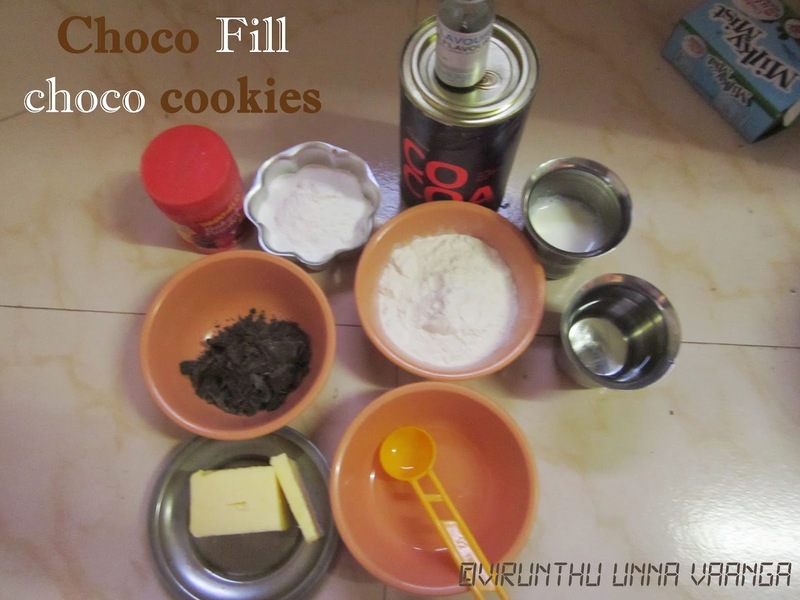 Flat the cookie dough, keep the broken cooking chocolates in the centre and cover it carefully as shown in the picture to make circle cookies. 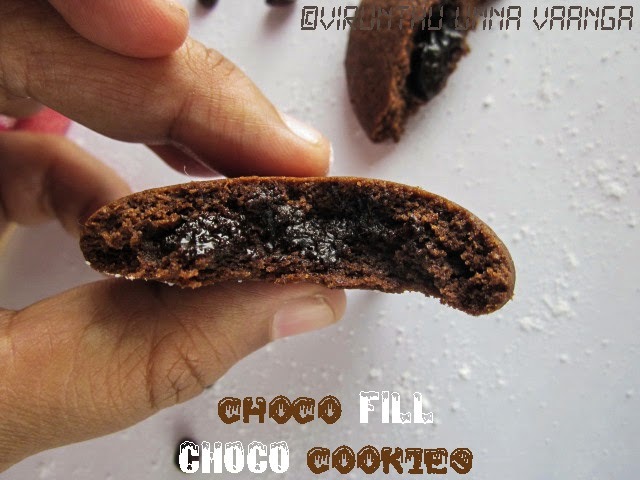 Bake it for 15-20 minutes. 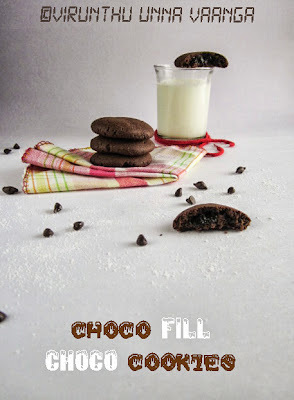 Serve it warm to enjoy the choco fills choco cookies. 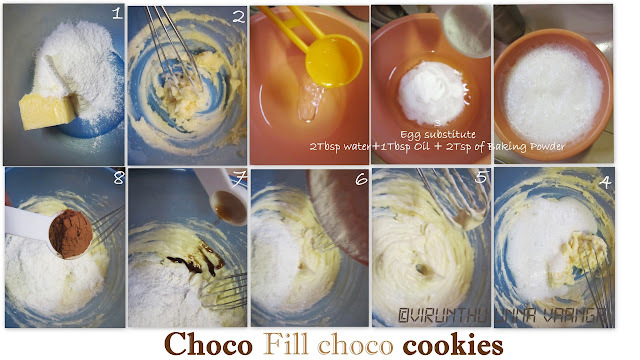 You can use one egg for the egg substitute or you can add little amount of milk to replace the egg substitute. Use cooking chocolate after broken into small pieces. 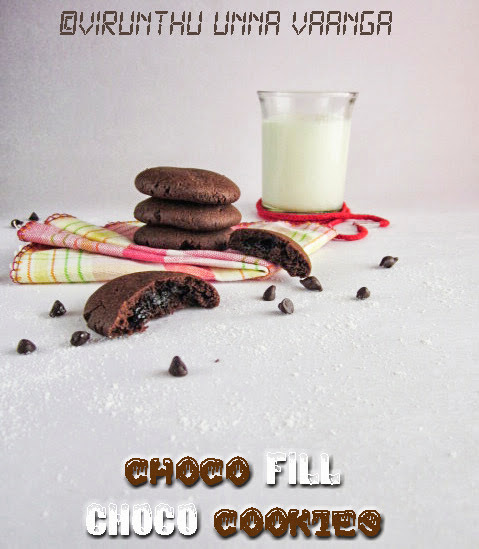 If you are not adding egg substitute that I given, add ½ Tsp of baking powder with maida and coco powder. Oven temperature and timing may vary from oven to oven, so keep checking after 12-15 minutes. ENJOY THE EVERY BITE OF THE WARM CHOCO FILLS!!! Omg, wat an ultimate feast, am in love with ur cookies.. Congrats on ur 250th post Viji, keep on rocking,wishing u many more milestones like this. 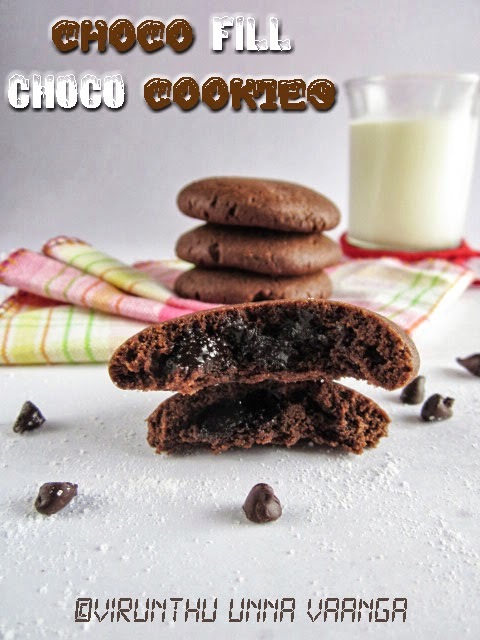 love these super choco chocolaty cookies, love to see you at my space and congrats for your 250th. 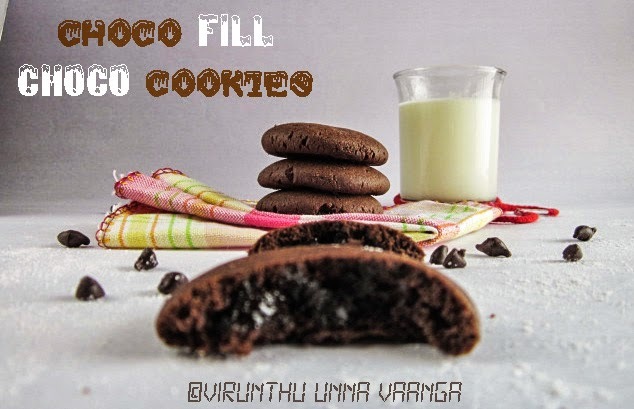 Congratulation viji on your 250th post, wish u many many more hundreds in future :) keep rocking dead! 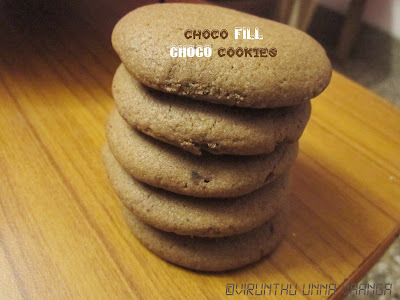 Choco filled cookies looks so delicious, looks perfect...am loving it :) lovely clicks n neatly presented da..nice ! 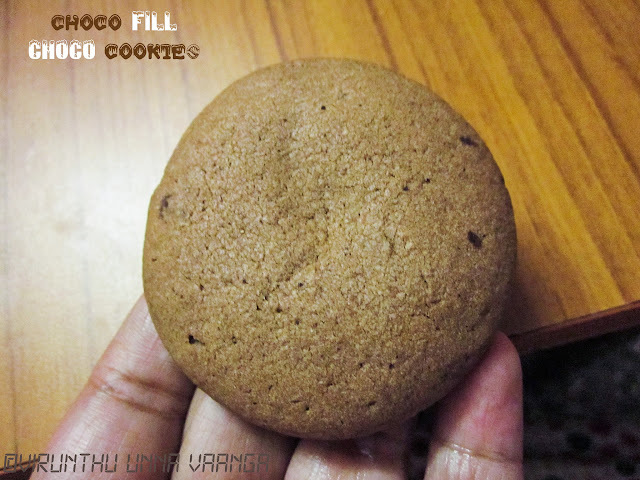 Viji, super clicks, wish to grab it from the screen, looks so delicious! 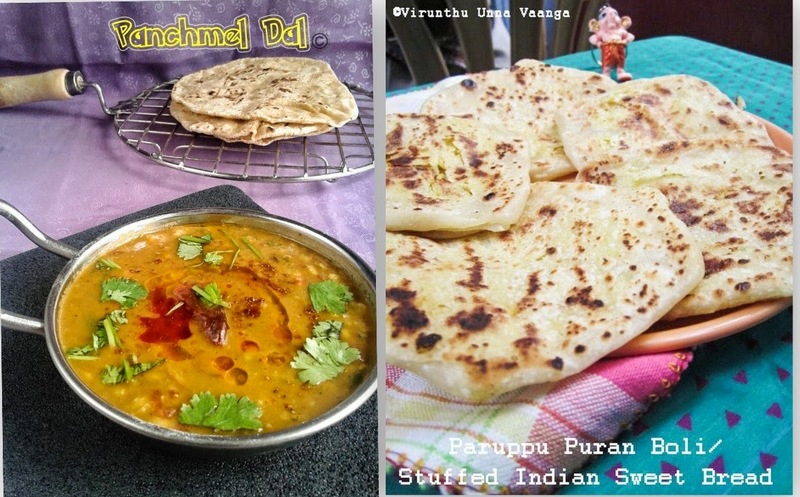 Congrats dear, awesome way to celebrate the 250th post.. Looks so delish.. Lovely pics too ! 250 வது பதிவுக்கு வாழ்த்துக்கள் விஜி, இன்னும் பல குறிப்புகள் கொடுக்கவும் வாழ்த்துக்கள். 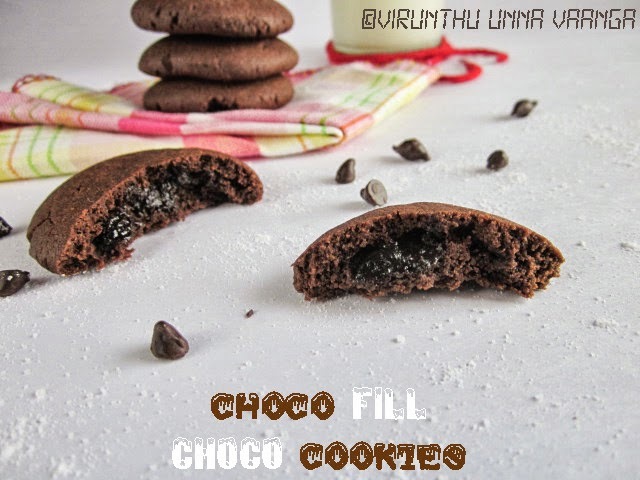 Wow been wanting to make these for ages. Love them. Bookmarking them. 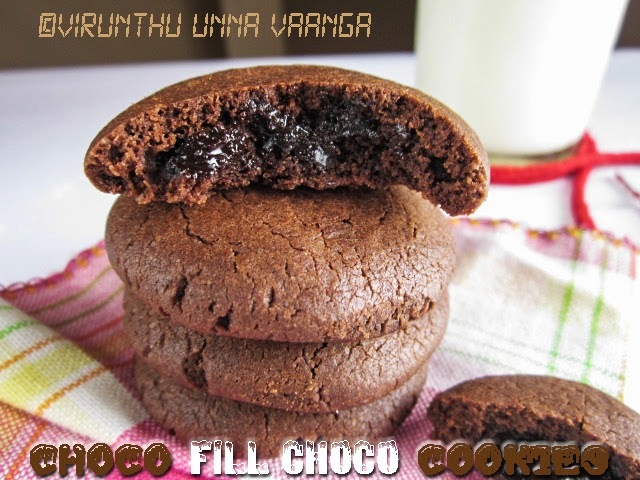 Amazing cookies Viji...these look exactly like Dark Fantasy...my favorite!! 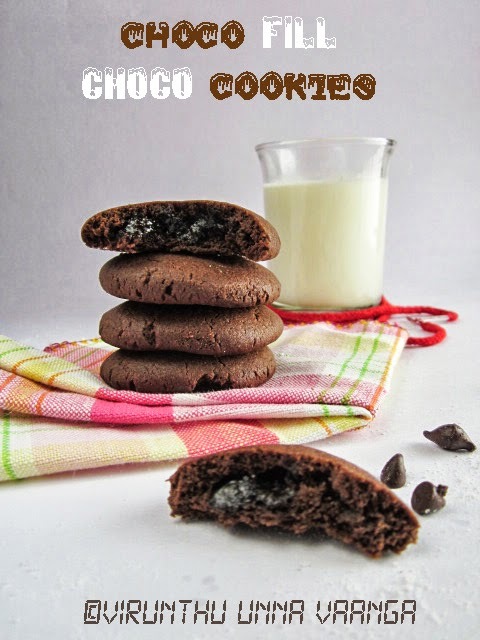 Mouth melting .. Beautiful cookies.. N fantabulous click I must say! Congrats dear.. Love each one your clicks.. 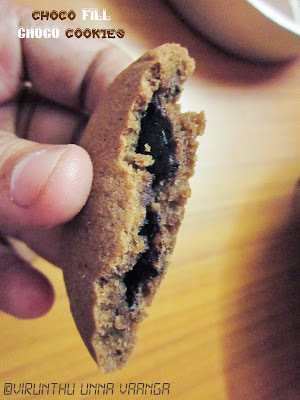 Even i am a big fan of sunfeast dark fantasy.. Perfectly made dear..
cookies looks fabulous,makes me drool..awesome clicks. My hearty congratulations to you Viji dear. 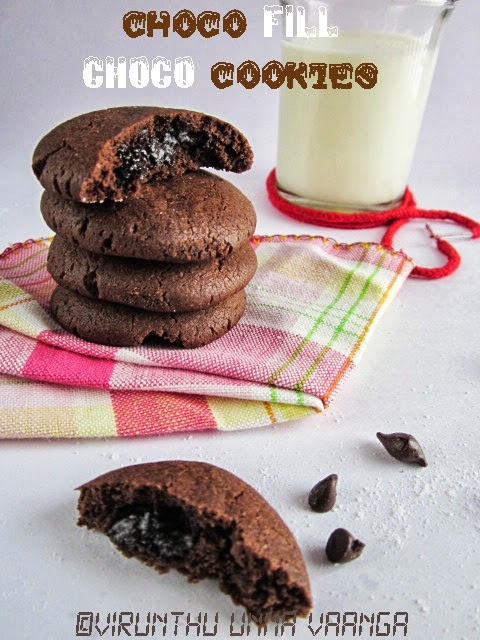 Absolutely lipsmacking good cookies. Wish to grab few from the screen itself. 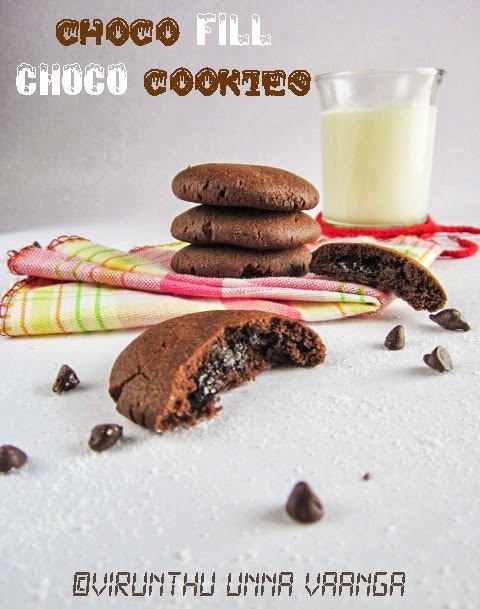 Congratulations dear, delicious choc. 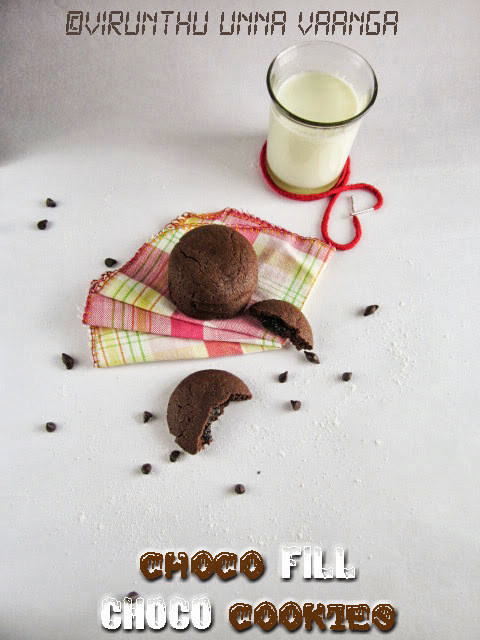 cookies to celebrate this occasion! Wonderful clicks! 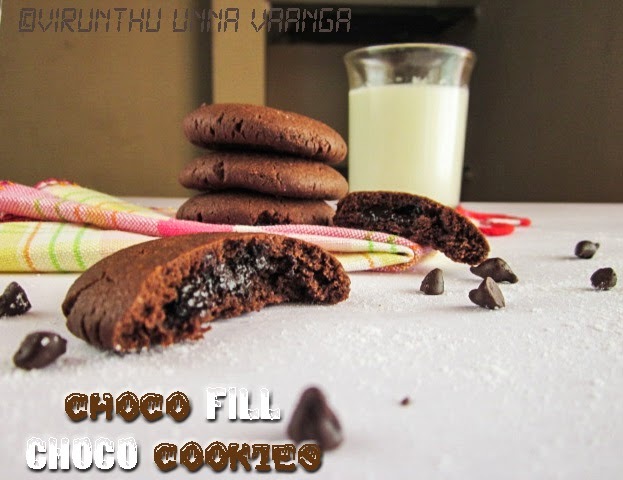 Hi, I tried this recipe today and the chocolate chunks inside just refused to melt no matter how fine i chopped them. Any idea why this happened?